Besides the Comet there was an entire program filled with highlights. As per usual upon arrival at Old Warden I find myself wondering why it has taken me so long to come back. 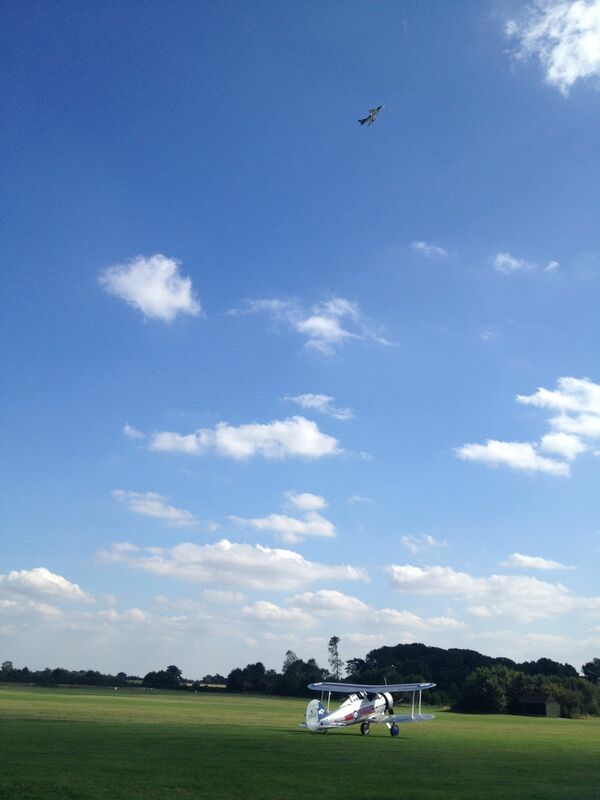 The sun was beating down on the airfield bringing out the best in the surrounding countryside. The airfield was bustling with aircraft and people alike. As we walked down to the flight line in front of the collection’s Gladiator, the familiar purr of the Bristol Mercury engine could be heard in the overhead. This sound marked the arrival of one of the day’s highlights, The Fighter Collection’s Gloster Gladiator Mk II; this being the first time the pair of biplane fighters had been seen together outside of Duxford. Over the past few years I have developed a newfound fondness for the Gladiator, so the chance to sit just feet away from both airworthy examples meant the day was a success before the flying even began, I can only hope this is the first of many visits the Duxford machine makes. 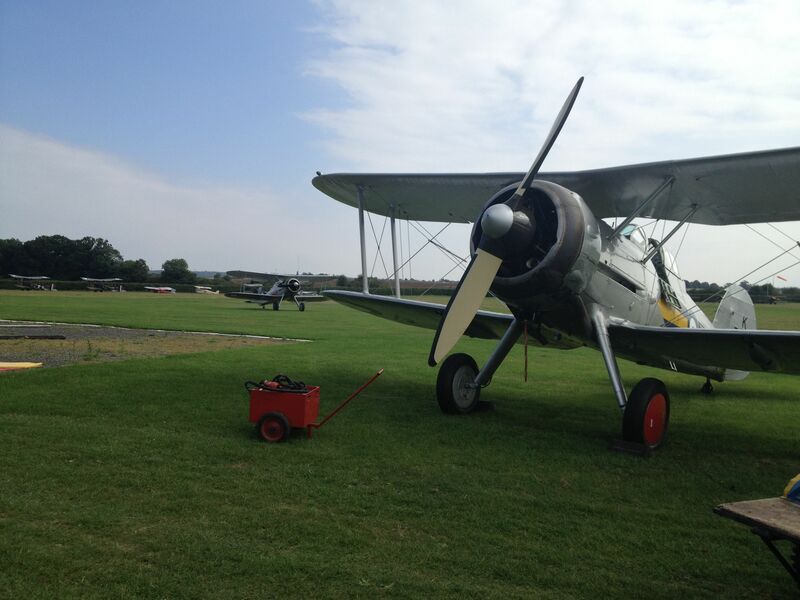 The Gladiator Pair (Shuttleworth, foreground. Fighter Collection in behind.) Await their turn. The morning went by quickly after wandering the, mostly empty hangars. (One of the real treats of the pageant show Is that the collection tries to get as many of its aircraft as possible into the air, a promise they certainly delivered on here.) Aside from non-flying aircraft or those in maintenance there were only a handful remaining in the hangars. Soon enough the collections vehicles were parading around the crowd line as the excitement started to build. A Hawker Hunter, operating out of North Weald started the show, it was my first time in a few years seeing a fast jet display at the venue and I was impressed. The display was very well put together, with many tight loops and turns keeping the speed lower than at larger venues, which meant the aircraft was kept in front of the crowd at all times. Not an easy feat in such a fast aeroplane at a small venue. As the Hunter finished its display we were taken back to an RAF airfield in the late 30s. Both Gloster Gladiators started up, taxied out and rolled down Old Wardens runway, a sight surely not seen on a small all grass airfield since the war. The two machines formed up for a series of formation passes, before splitting and each performing solo displays. Keith Dennison in the Shuttleworth Gladiator gave a wonderful, fast and sweeping display close into the crowd with a number of topside passes, while Brian Smith in The Fighter Collection’s machine combined this with loops and rolls. Between the two of them they really showed what the little biplane could do. A series of tail chase passes concluded the segment with both aircraft touching down on the cross runway. A unique pairing of Avro Tutor and Avro 19/Anson followed, again displayed in typical Shuttleworth fashion and a joy to watch. Then came a display billed as 1930s aerial carriages, consisting of a pair of DH60 moths, a tiger moth and the unique Desoutter, all of which flew a wonderful, flowing routine. First World War types were represented well, especially poignant given the 100th anniversary this year. The highlight was undoubtedly the pair of reproduction Be2s. These fragile looking machines gracefully circled the Bedfordshire countryside, hardly making a sound, giving an idea of what operations must have been like in the early days of the war. Other WW1 types on display were the Avro 504, Sopwith pup and the wonderful pairing of Bristol M1C and F2b, two unique aeroplanes displayed expertly together. Another pleasant addition was the biplane formation featured towards the end of the main show, comprising of Blackburn B2, Polikarpov Po-2, DH51 and Hawker tomtit. With the Blackburn performing aerobatics in the overhead as the other 3 aircraft roared low across the airfield in formation, before breaking into a flowing tail chase. The Lympne trials were well represented at the show, with the Cygnet and Anec II displaying early in the show. The line up was completed in the evening portion by a particularly sporting performance by the eccentric English Electric Wren. Trainers were well represented too, with impressive routines being flown by the Piston Provost, DHC Chipmunk and Miles Magister. We were also treated to 3 passes from the Memorial Flight Spitfire and Hurricane, the latter on its first trip out in a new scheme. As the main display moved towards its conclusion it was time for a World War 2 set piece, featuring the Sea Hurricane, Fiesler Storch and Westland Lysander. Peter Holloway performed his usual physics defying display in the Storch, featuring sideways and ultra slow flying, which kept the crowd captivated. This was followed by a unique Storch and Hurricane “dogfight” something you don’t see everyday and concluded with a fast Lysander solo display. It was left to Keith Dennison and Stu Goldspink to wrap up proceedings for the main show, taking off in the two stunning Hawker bi-planes, the Hind and the Demon for a display to remember. A number of formation passes led into one of the most exciting low level tail chases I’ve seen, with the chorus of kestrel engines ringing into the evening. With that it was announced there would be a short pause in proceedings to allow visiting aircraft to depart, then the Edwardians and the Wren would go up and hopefully, if conditions improved, the Comet. 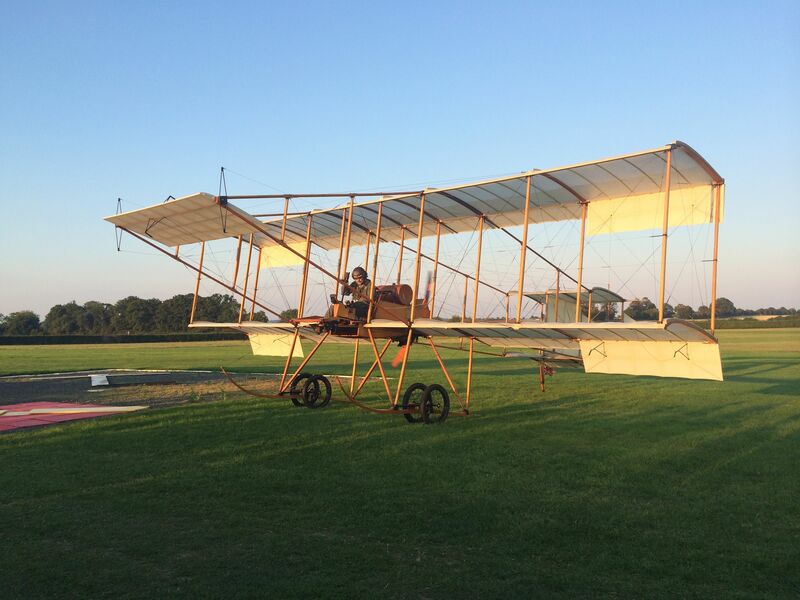 The Boxkite and Avro Triplane did indeed go up, performing a graceful, circling display in the evening skies, these early aircraft are always a treat to see fly and this occasion was no different. Then of course, came the moment many on the airfield had been waiting for. Well over an hour after the scheduled close of play the Comet finally took to the skies for its first public display in 21 years. I could, and have written a whole post simply for that moment, so I won’t go on too much here. Safe to say it was one of the moments of the year, if not a lifetime. 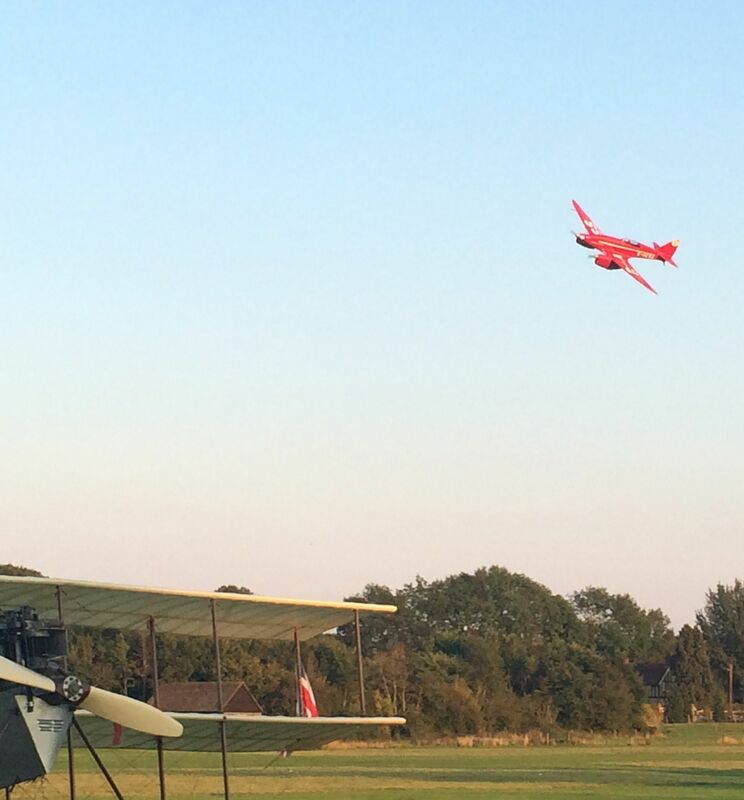 The Comet flies past, with the Avro Triplane in the foreground. As chief pilot, Dodge Baily shut the Comet down back at the crowd line to a rapturous applause, the end of a perfect days flying finally came. Unless I have miscounted we were treated to no fewer than 38 aircraft performing, no doubt I will have missed some out in this report, an impressive tally that many airshows would be envious of. 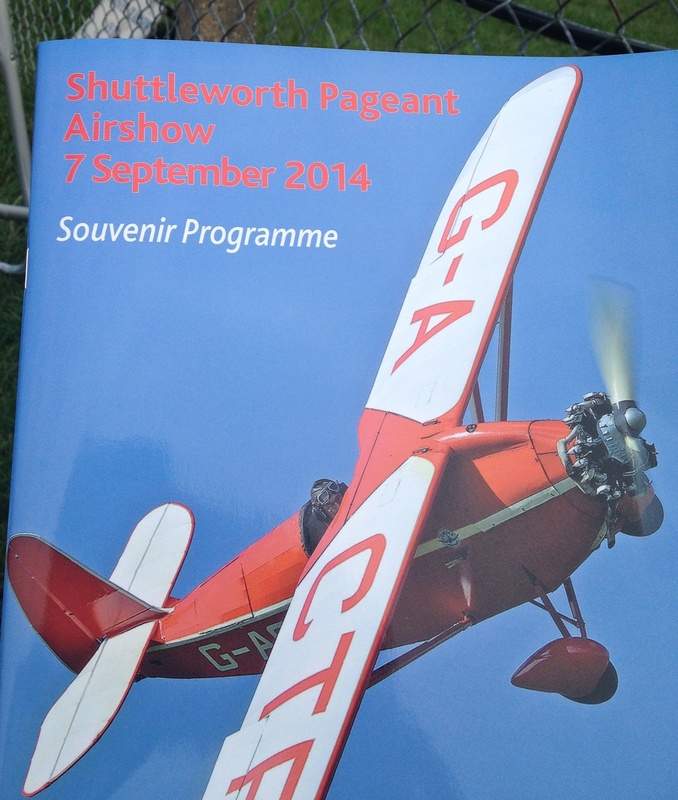 Shuttleworth managed to pull off one of the best shows of the season and will certainly have to try hard to better it. I think we all look forward to seeing them try. 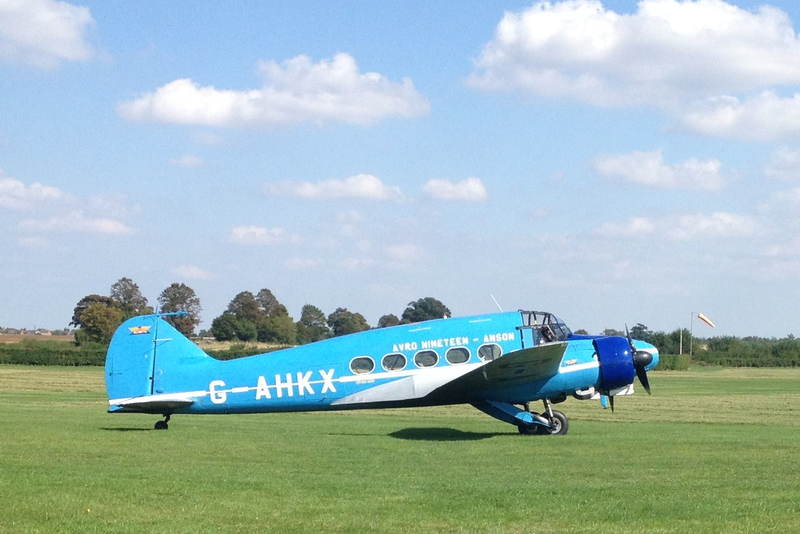 More information on the collection, their aircraft and future events can be found at http://www.shuttleworth.org.